Penny is stoopid. So stupid, in fact, it takes the misspelling of the word to properly address how stupid she really is. There was a time when she was almost kind of smart. She lived in Salt Lake City and worked at Salt City CDs. Back then, you could count on Penny to guide your musical tastes to unearth artists that were deeply underground. 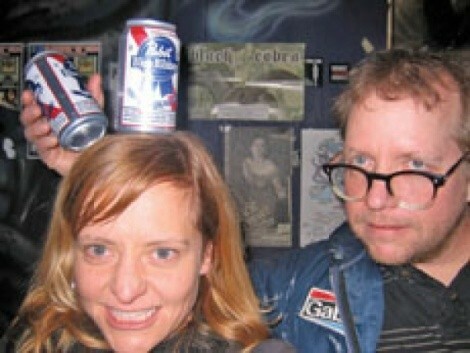 She had a program Saturday nights on KRCL called Kicking Judy, and sometimes Penny played music. Mostly, though, she had a talk-show bully pulpit with snippets of songs. At that time, to say Penny was my best friend would be like trying to define the relationship of Bonnie and Clyde. This isn’t because the press declared us Public Enemy No. 1, but because there are rare times when you find a partner in crime like I had with Penny. Then things went south. Very literally and kind of figuratively, but you probably get the point. We haven’t talked or seen each other in what would psychiatrically be called a healthy amount of time. Old relationships can be like mayonnaise left in the refrigerator years past their expiration date. As long as you don’t add the mayo to the potato salad, everything will be OK. Just don’t touch it. Leave it alone. Sure, there’s salmonella in your life. But, if you ignore its existence, it doesn’t exist. It’s like the opposite of Descartes’ methodology: I don’t think about it, therefore it’s not there. Penny, on the other hand, wanted to make potato salad. 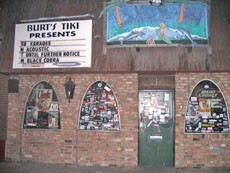 I knew just the place to meet—Burt’s Tiki Lounge, 726 S. State. On Christmas Eve a few years ago, my cat Vincent 45 had to be put to sleep. By the time the pentobarbital had taken effect, only 30 minutes remained in the night before last call rang in Christmas cheer. The ground was frozen, and I didn’t have a jackhammer in my car, so I took my cat, packaged like a present in a cardboard box, to Burt’s Tiki Lounge. There, I buried him in the Dumpster. Once a year, I go to Burt’s with a handful of catnip, throw it in the Dumpster, then go inside and hoist a beverage to Vincent 45’s ninth life. If Burt’s Tiki Lounge was a good enough place in which to bury my cat, then certainly it would suffice to bury the hatchet. In her e-mail, Penny said she was free Tuesday night. 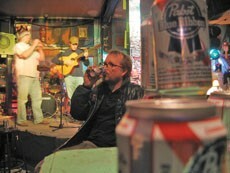 I responded that on Monday nights, Pabst Blue Ribbon is only $1 at Burt’s. Then I didn’t hear from her for a while. I guess, in Penny’s book, there is a big difference from “being free” and only costing a dollar. For someone who is named after the lowest denomination of American currency, I thought she would be impressed by my thriftiness. She wasn’t, but we still met on Monday with a fistful of dollars. Each George Washington we pulled out of our pockets seemed to bridge the North/South gap that had divided us for so long. First, we toasted to a dead cat and, by the 16th dollar, we raised our aluminum cans to, however corny this may seem, us. Scotty was tending bar, so I said, “Those eggs in the jar—isn’t that just a salmonella cesspool?” He said that eggs in vinegar brine only get better with age. It’s all how you cure the egg. With two more Pabsts and two eggs, I walked over to our table. Penny was balancing a Blue Ribbon can on her head. It was like we’d seen each other yesterday, and the salmonella of our past had cured into a famous pickled egg. At that moment, I realized, I’ve been stoopid.